Now B is of datatype varchar2 and X is a string of varchar2 values separated by commas. Values for X are select distinct values from a column(say CL) of same table. This way pivot query was working. But the problem is that whenever there is a new value in column CL I have to manually add that to the string X.
I tried replacing X with select distinct values from CL. But query is not running. The reason I felt was due to the fact that for replacing X we need values separated by commas. Then i created a function to return exact output to match with string X. But query still doesn't run. The error messages shown are like "missing righr parantheses", "end of file communication channel" etc etc. I tried pivot xml instead of just pivot, the query runs but gives vlaues like oraxxx etc which are no values at all. Maybe I am not using it properly. Can you tell me some method to create a pivot with dynamic values? -- concating activities name using comma, replace "'" with "''" because we will use it in dynamic query so "'" can effect query. I am not exactly going to give answer for the question OP has asked, instead I will be just describing how dynamic pivot can be done. Here we have to use dynamic sql, by initially retrieving the column values into a variable and passing the variable inside dynamic sql. Consider we have a table like below. 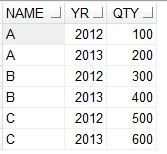 If we need to show the values in the column YR as column names and the values in those columns from QTY, then we can use the below code. If required, you can also create a temp table and do a select query in that temp table to see the results. Its simple, just add the CREATE TABLE TABLENAME AS in the above code. 1) Download the zip package to find pivotFun.sql in there. 2) Run once the pivotFun.sql to create a new function 3) Use the function in normal SQL. Works well with up to 1m records. Does this solution works in Oracle 11g? As I am unable to execute subquery in this format. Given the dates involved, then yes, it should. 12c wasn't around back then. Double check privileges. You cannot put a dynamic statement in the PIVOT's IN statement without using PIVOT XML, which outputs some less than desirable output. However, you can create an IN string and input it into your statement. First setup the string to use in your IN statement. Here you are putting the string into "str_in_statement". We are using COLUMN NEW_VALUE and LISTAGG to setup the string. Now use the String statement in your PIVOT query. There are limitations though. You can only concatenate a string up to 4000 bytes. What is the clear columns command for? You can't put a non constant string in the IN clause of the pivot clause. You can use Pivot XML for that. hi your method is working actually but output i am getting in xml format. can i get output as a table with rows and columns ? AFAIK, not dynamically... But how do you intend to use a result which you don't know its structure ?